Aurora News: Shiigeru wreckage site will be salvaged & cleared in a joint Gallente/Caldari operation. Shiigeru wreckage site will be salvaged & cleared in a joint Gallente/Caldari operation. During the Battle for Caldari Prime, the Leviathan-class Titan CN Shiigeru crashed on the planet, ending the Caldari military presence in orbit of their homeworld. Due to the massive size of the ship, the crash had wide cataclysmic effects on the planet and its wildlife, triggering earthquakes and massive forest fires. The atmospheric entry also caused the ship to fracture, raining debris over large parts of the planet. After the fight, early cleanup & salvage operations could only clean up the scattered smaller debris. The larger wreckage was still too hot and unstable to be properly handled. It required months of mapping and planning to start a proper salvage & cleanup operation. During this time, the colossal wreck affected the world badly, from spilled radioactive elements to detonating unstable ammunition, not to mention the high amounts of toxic fumes coming off from the wreckage. Now that all the mapping & planning has been done in order to clear out and salvage the wreckage safely and efficiently, it was time to start the practical side of it, the actual salvaging. This introduced a new issue, a political one. The Shiigeru namely crashed in an area that falls under Material Acquisition administration, which means it's under Gallente rule, as MA is a daughter corporation of Quafe. To add to this, the Kaalakiota mountain range, where the Titan crashed, holds a major spiritual importance to the Caldari. All this could cause unrest with the Caldari if not properly and respectfully handled. In order to avoid such issues, MA invited Ishukone Corporation to assist with the salvage & cleanup operation. This move provided to be a positive action, as many cheered at the prospect of Gallente and Caldari corporations working together in order to assure the Shiigeru wreckage will be salvaged & cleared with respect to the Caldari people. Part of the retrieved salvage will be used to rebuild the Qaiian Tower, the regional headquarters of the Nugoeihuvi Corporation. 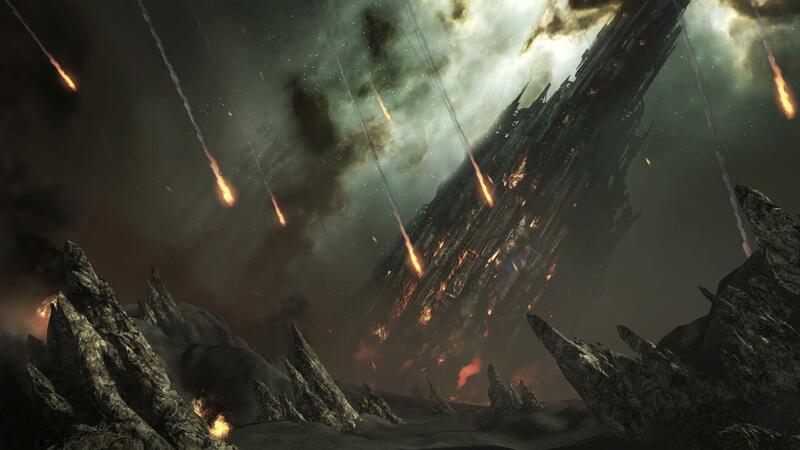 This will act as a memorial, to remind everyone that even from the ashes of defeat, the Caldari people will rebuild their future, never be put down by anything. Also, this act will improve Gallente/Caldari relations and perhaps open the door for more future joint operations. Nice to see people following the EVE lore, would like to see an event like this but with more interaction between EVE and Dust. I really hope this one can be one step on the right direction for the end of that unnecessary war. There's many Caldarians I don't like, but I respect their ways and belief, perhaps the Federation could start making joint operations with the State, get the right relations, and put an end once and for all. Amazing job, thanks for reporting this Yan. Ayem Colony expansion has begun! The Arcology welcomes over 28.000 refugees! Caldari Navy arrests Wing Commander Okuuda! The Arcology welcomes over 11.000 new immigrants!